A special 2-DVD collector's edition of the acclaimed epic film on St. Augustine of Hippo. 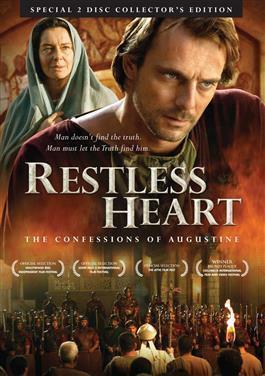 Filmed in Europe, the first full-length feature movie on Augustine, it uses a historic backdrop to tell the true story of one of the Church's most beloved and well-known Saints. Its message of sin, conversion, redemption is as timely today as it was in the 5th century of Augustine. It is the story of a gifted man who pursues fame and fortune without a moral compass - and the dramatic changes that occur in his soul when challenging events lead him to see the light of truth. It also chronicles the collapse of the Roman world and how Augustine laid the intellectual foundations of what became Europe. With Augustine, the stories of two other great saints, Monica and Ambrose, are also portrayed. DVD set includes the 133 min. theatrical version, and the 203 minute full-length original version, with a 24 page Collector's Booklet and study guide.